In Outlook 2007, Microsoft introduced the "Todo-bar". This is a list of tasks, mails and appointments that you can pin to the right edge of Outlook. See screenshot below. Out of the box, GogTasks synchronizes the tasks from this list, but expects you work from the Tasks bar instead. If you on the other hand work with the Todo-bar as the primary reminder list, and want GogTasks to synchronize the flagged mails as well, this can be achieved by checking the option Sync flagged mail items as tasks in the settings form. You will also have to select a single folder to which GogTask will synchronize these "mail-tasks" at Google. 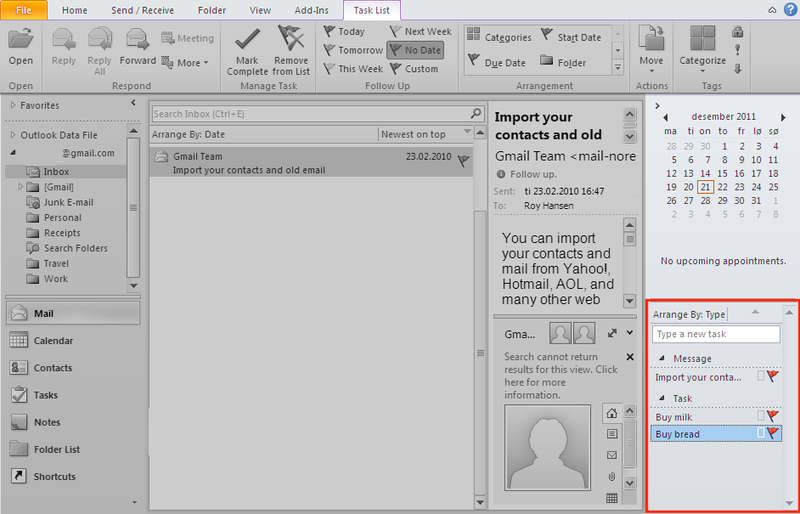 in Outlook 2010 when sorted on "type"
synchronization of flagged mails as tasks. So what happens when this is set up? Well, the Todo-bar acts a little different than a standard task list. In addition to the obvious fact that it contains mails, it also does not contain tasks with status completed. When you remove the flag from a task using the Todo-bar, it is marked as completed. A mail does not have a "completed" state, so when you remove the flag from a mail, GogTasks translates that into a delete action of the tasks at Google. This is because if we were only to flag it as completed, the list with former mail-tasks would grow infinitely and need manual maintenance. New mails are created as tasks at Google in the folder configured by you. 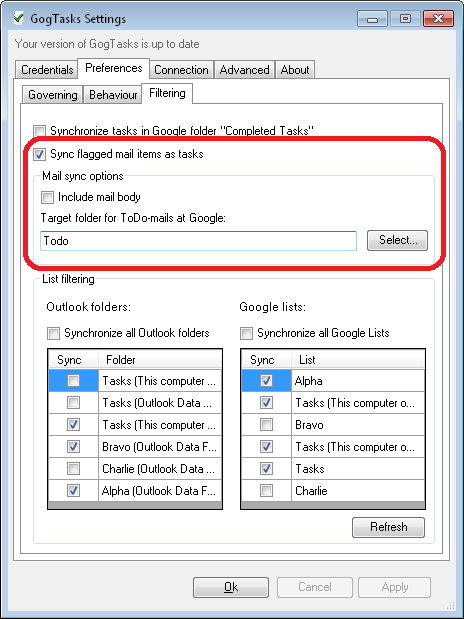 When you remove the flag from a mail in Outlook, the corresponding task at Google is deleted upon next sync. When you delete a mail-task at Google, the corresponding mail will be unflagged upon next sync. When you mark a mail-task as completed at Google, the corresponding mail will be unflagged upon next sync and the mail-taks at Google will be deleted. This is to preserve consitency - no mail-tasks shall linger in the Google Todo-folder when completed. When it comes to calendar events - this is outside the scope of GogTasks as an application. To achieive calendar synchronization, please check out Google Calendar Sync from Google. This application works well alongside GogTasks.